Chop the onion finely and sauté in a saucepan in a few dessertspoons of oil, then add the peas, salt and pepper. Lower the heat, cover, and cook until the peas are tender, adding little hot water if necessary. 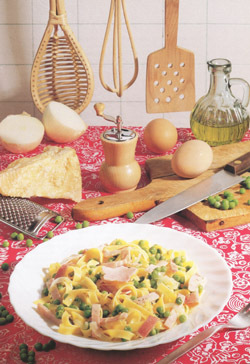 Cut the ham into small strips and add to the peas just before You switch off the heat, allowing the flavours to blend. In a souptureen mix the eggs with the Parmesan, a pinch of salt and a twist of freshly-ground pepper. When the pasta is cooked, drain and tip into the tureen, mixing well, then pour over the pea and ham sauce and stir it in gently.